Even if surgical fusion today could be considered the standard treatment of care for chronic lumbar pain in degenerative disc disease (DDD) in patients failing conservative treatment, patients with mild to moderate DDD may decline “major” surgery which irreversibly alters the spine, prolongs recovery time and limits return to work in younger patients. Dynamic stabilization devices have been designed to alleviate pain by stiffening or supporting the motion segment in attempt to restore the native biomechanical neutral zone. Examples of these devices include the Dynesys (Zimmer Spine), DIAM (Medtronic; Minneapolis, MN), Wallis Devices (Abbott Spine; Austin, TX). These “dynamic stabilizers” have typically required open exposures with concomitant muscles stripping and ligaments derangement, compromising the intrinsic stability of the spine. Our purpose is to evaluate a novel percutaneously device, permitting a dynamic stabilization in the degenerative lumbar spine. 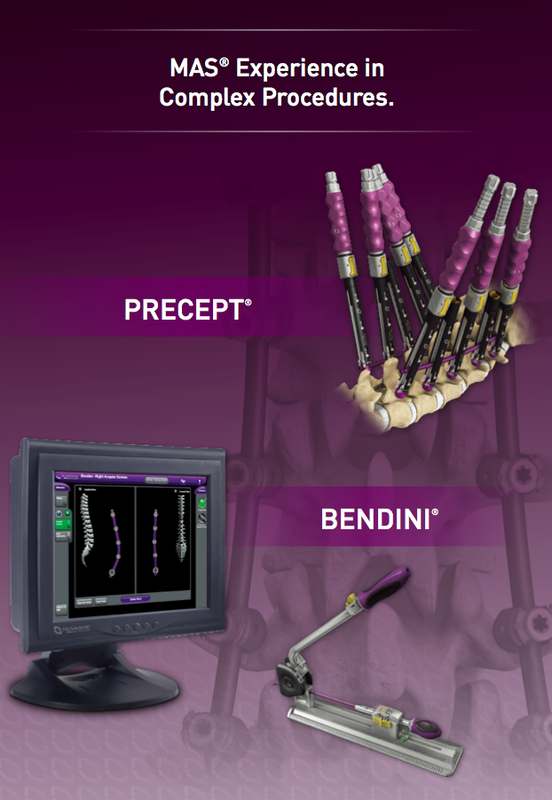 PercuDyn™ (Interventional Spine®, Inc. CA) is a novel percutaneously extension – limiting device that has been developed to support and cushion the facet complex. It is a titanium screw-based system with a polycarbonate- urethane bumper that lies against the inferior articular process and is anchored into the pedicle by the screw in order to obtain a posterior dynamic stabilization (PDS) (Fig.1). Biomechanical studies on specimens and finite element analysis showed no significantly alteration in the kinematics of motion and intradiscal pressure adjacent to the instrumented levels. Moreover there was a significant reduction in the flexion-extension ROM and a decrease in intradiscal pressure at the instrumented level. Instrumentd spines had 62% less motion in flexion and 49% less motion in extension; neuroimaging analysis showed a reduction in compression of the posterior disc during extension, and no difference during flexion. Finally has been found an increase in the foraminal area during extension (36 %) and during flexion (9 %). 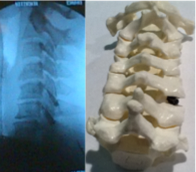 Cervical radiculopathy due to spondylosis and stenosis can be treated with a new minimally invasive surgical approach, using a novel percutaneous device permitting cervical vertebral body distraction and fusion. The D-TRAX (Providence Medical Technology, Inc.) implant is a titanium screw and expandable washer designed to percutaneously decompress and distract the corresponding nerve root, opening the neural foramina. The facet is stabilized with a dedicated instrumented distraction. Bone healing is promoted by rasp, decorticator and autologous bone implemented by tri calcium phosphate, in order to obtain a fusion. The procedure is performed through 2 cm skin incisions (Fig. 2). Patients refer symptomatic clinical radiculopathy without mielopathy, unresponsive to both conservative treatment of at least 1 year, and pain management procedures (thermal rizothomy by RF treatment). D-Trax appears to represent a first step alternative to conventional Anterior Cervical Discectomy and Fusion (ACDF) for treating through minimally invasive surgery, radiculopathy due to cervical spondilosis. Conventional treatment for cervical radiculopathy due to spondylosis included Anterior Cervical Discectomy and Fusion (ACDF) or total disc replacement in order to reduce the adjacent segment disease. In both procedures disc and bone are removed to decompress the nerve root, and reported complications included neurological complications, esophageal injuries, dysphagia, recurrent laryngeal nerve palsy, prosthesis dislocation. Two years follow-up results, after proper indication based on imaging and clinical evaluation, are very interesting (85% excellent results), in order to avoid ACDF.